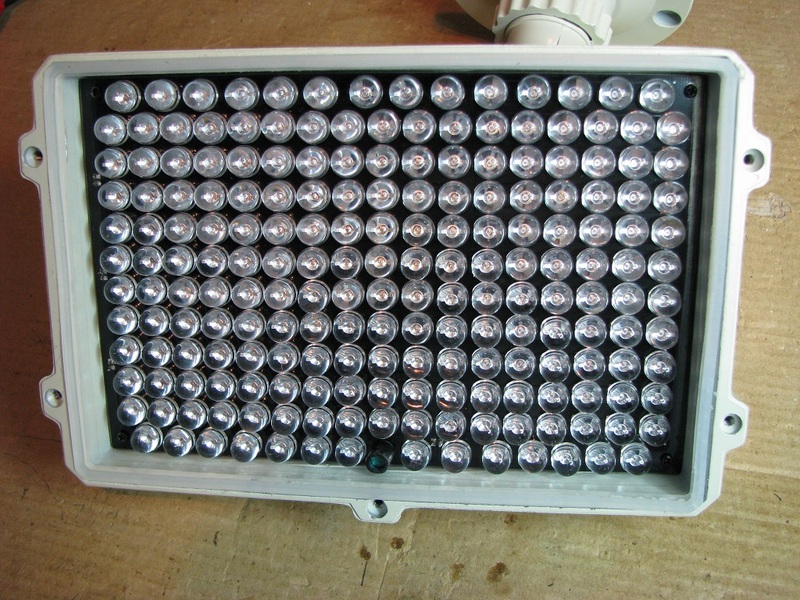 » CMVision IR130 IR Illuminator LED Failures! I can no longer recommend the CMVision IR130 infrared illuminator because the IR LEDs are failing at an unacceptable rate! I noticed several people reporting similar issues in the Amazon reviews and now it is happening to me. Keep reading to see my forensic analysis and exactly what I found is going on here, and why I I am not going to waste my time repairing this, even though I know what's wrong and the replacement parts are inexpensive. It's been a little less than one month since I installed this unit, and you can see my initial review of the CMVision CM-IR130 here. I actually bought this illuminator in August of 2016, and Amazon reviews were mostly positive at that time. I didn't install and use it until August of 2017 when I did my recent review. This did run great for a couple of weeks but then I noticed that a string of six LEDs had stopped working, and I didn't really do anything about it at the time other than take this picture and keep an eye on it. A string of six LEDs in the top middle has stopped working. Oh no, more LEDs are going dark! It's now been one month that this CMVision IR130 has been running and I notice that two more strings of 6 LEDs are not working. Time to take it apart and see what is going on here. Not going to bother with checking the warranty because I bought it 13 months ago and I'm more interested in finding out what is causing these to fail. I didn't think to get a photo of the three strings not working outside, but here it is running on my workbench while I am checking it out. Three LED strings have failed now - seen here running on my workbench. The front bezel lifts right off after using a 2.5 mm hex key to remove the 5 screws that you can see here, still assembled. With the front bezel off you are looking at the glass surrounded by a silicone seal, and I honestly wasn't sure exactly what to do with it since it didn't seem to be easily sliding out of there. I pried and prodded for a while and eventually got the glass out out. As you can see in this photo, the glass just sits in the silicone seal and the seal is actually glued to the aluminum housing. You can probably see in the lower right of the photo below, where I pulled the seal away from the housing in one area, and I'll use some adhesive when I reassemble it, but I'm not really worried how it turns out and you'll see why as we dig into the electronics shortly. I think the proper technique would be to use a plastic tool of some sort to slip the glass out from the silicone seal, and that's what I'll try first when I go to reassemble this. I also believe it's meant to be disposable and not a repairable product given the design of the seal on the glass. You might notice in the photo above that there should be a screw holding each of the four corners of the LED circuit board, but there is no screw in that top left hole. 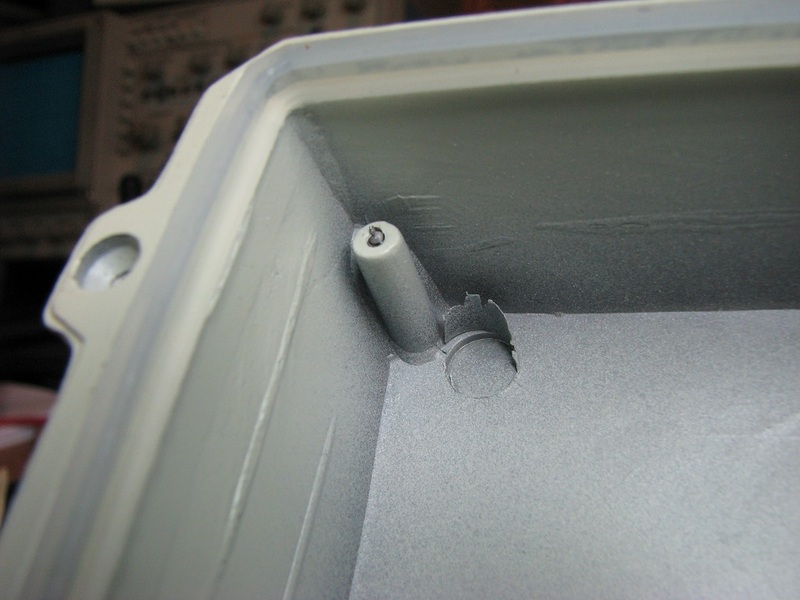 A closer look at the top left LED PCB mounting stud shows us why there isn't a screw there. There appears to be a screw broken off in the mounting stud, and they just shipped it out this way! The proof is in the picture here, and this CMVision illuminator is already not looking like a quality product to me upon closer inspection. Here is the overall picture of the entire housing with the LED PCB removed. You can see the power board still installed in the housing, and the back of the LED PCB with the LED side facing down. You can see that there is a desiccant pack zip-tied to the cabled coming from the power board to help keep moisture at bay, which is nice. There are four mounting holes in the power board, but only two screws and two studs holding it, which should be fine given the light weight of the the power board. Here's another photo with the power board removed so you can see everything now. This also gives us some more wire length which will make it easier when we start troubleshooting the LED board soon. I will be the first to admit that I am not an engineer, I'm a technician. You see the 12 volt DC supply coming in through the back of the housing to the power board, which contains the power control and regulation circuitry. One wire pair from the power board goes to the photocell at the bottom of the LED board, and that's used to tell the power board to switch the LED assembly on or off. That switched power for the LEDs is fed by three separate wire pairs, and all of that seems to be working perfectly fine. 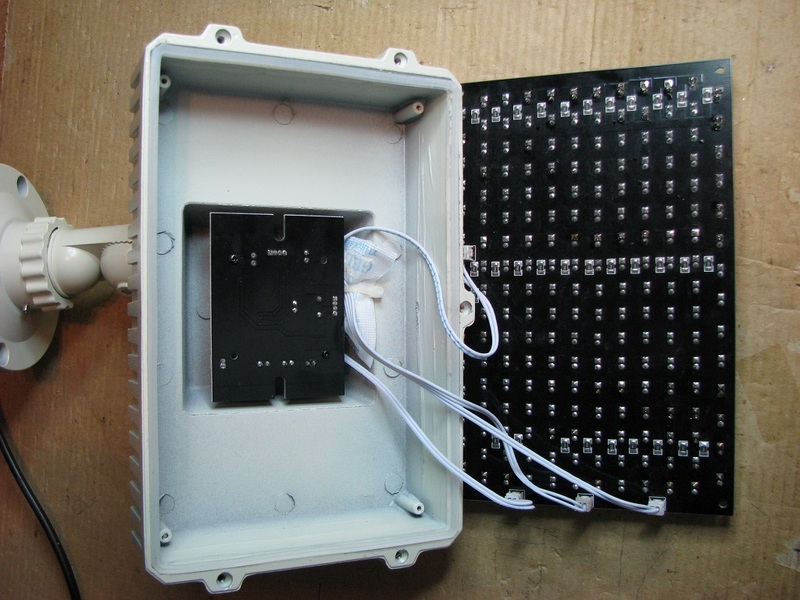 Each of the three powered sections of the LED board contains a number of even smaller part groupings, which are made up of strings of 6 IR LEDs and a 39 Ohm resistor in series. Each string like this has 11 Volts DC applied to it when the illuminator is turned on. A properly working string seems to have somewhere around 1.46 Volts dropped across each LED and the resistor has around 2.2 Volts across it. 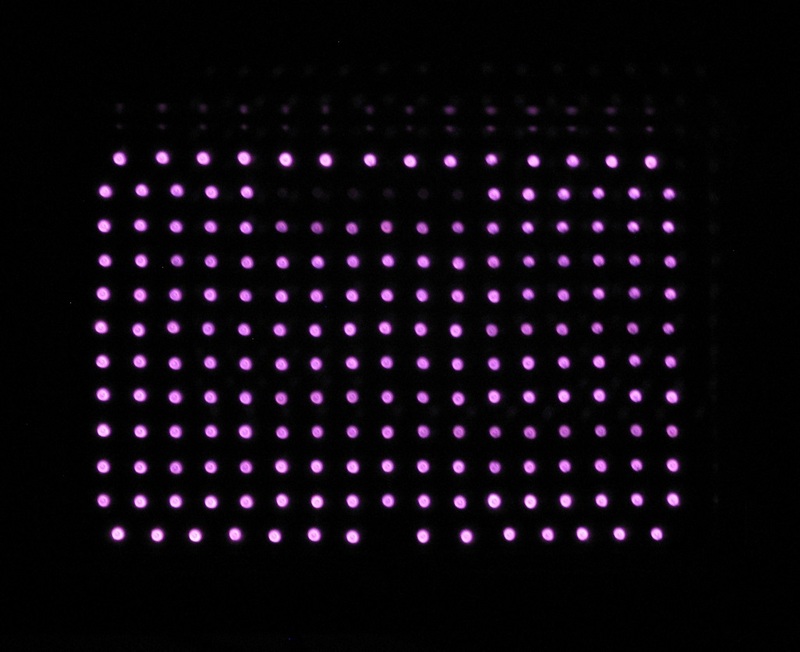 The failure mode of the LEDs seems to make them go up in resistance. High enough to screw up the circuit so the remaining good LEDs no longer work, but still letting enough current flow through the series circuit so I can measure the voltage drop across each component and tell which one is bad. In the first failed string I get around 4.5 V across the failed LED and around 1.2 V across the remaining ones, which is not enough to turn them on. The other failed strings are similar. If these LEDs were all within spec they would all have a very similar voltage drop across them. 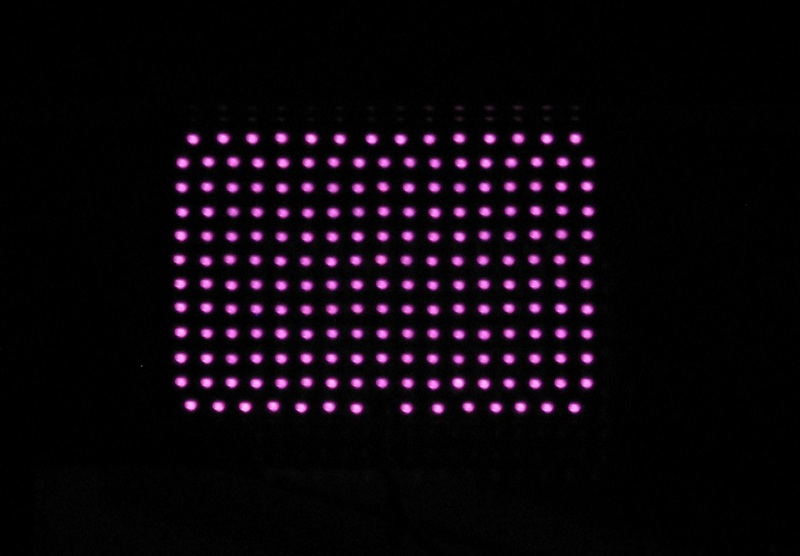 The voltage drop across all of the working LEDs varies widely though, indicating widely varying LED quality. I can't even find two identical strings. It varies so much that I'm not sure what the normal expected voltage drop is, other than "somewhere around 1.46 Volts". Why not repair it then? If this had been running well for a long time and I had three failed LEDs, and if the working LEDs were all similar and in good shape, I might just order some and replace the few that failed, but that's not the case here. This has been running for less than a month and has three failed LEDs already. Recent reviews on Amazon also indicate that this has become a common problem with this particular unit. 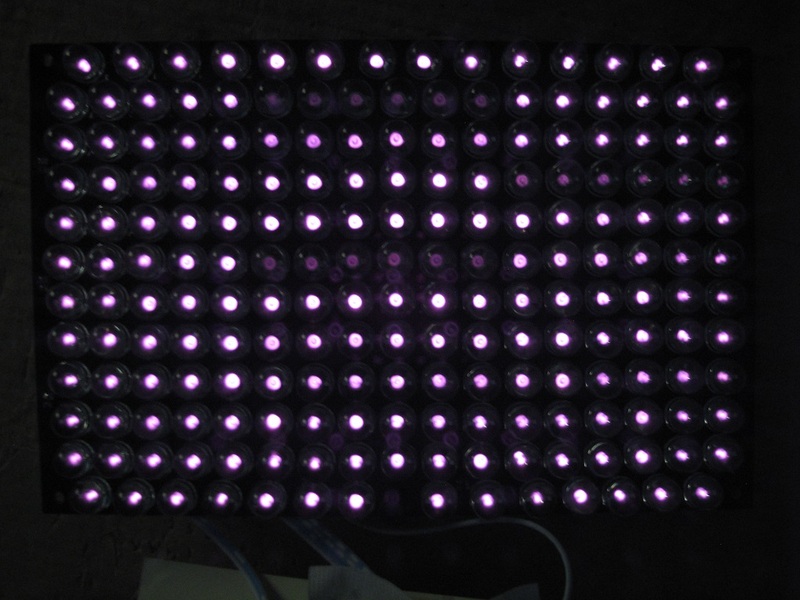 During my troubleshooting today I expected to see 195 good LEDs and 3 failed LEDs. I did find three that are definitely bad, but the remaining 195 are not quite what I was expecting. The voltage supply is good and solid, the soldering looks good enough, and all of the resistors check good and measure the same. 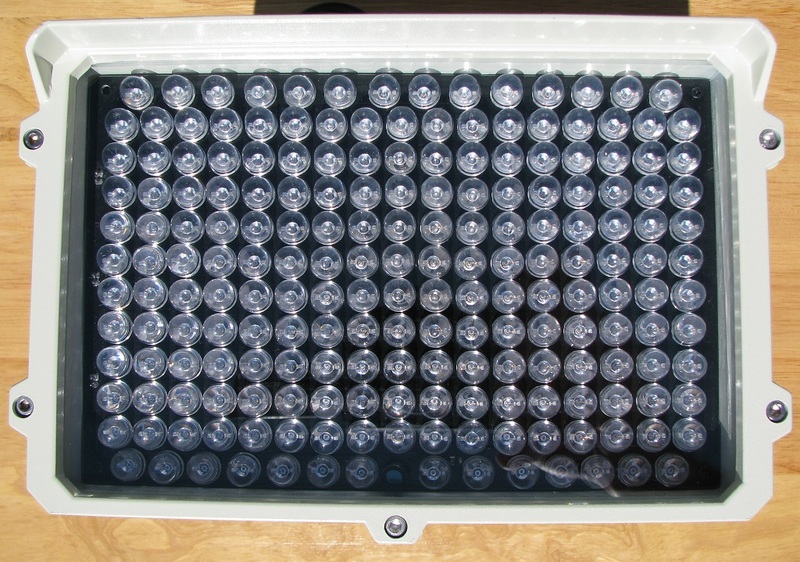 The entire batch of LEDs does not look good though and they do not measure the same. Sure, many of them seem fine, but over half of them have voltage drops across them that are way too high or too low, indicating that half of these things are way out of tolerance and probably on their way to failing soon. It's almost like there was no quality control in place at all when these LEDs were made. Whatever the real reason, these are VERY unreliable and I expect many more to fail as time goes on. I'm not going to replace three when I expect at least three more to fail in the next month. I'm not going to disassemble and repair it again in the future with it being so difficult to remove and replace the glass on the front. I'm going to try to put it back together and use it as is until so many LEDs fail that it can no longer put out enough useful light, and then I am going to throw it in the trash where it belongs! I no longer recommend that anyone purchase one of these. Thank you very much for the detailed analysis of the failures. I was about to order one of these, but will now look for another product. I’m glad that you found the article helpful. CMVision did recently contact me and let me know that they are aware of the issue. They tell me that the failures are due to heat buildup inside this unit, and they have redesigned it to run cooler. I don’t know if they’re selling the new improved design under this same model number or as a different one though. I tried to avoid buying a CM Vision product due to failures, I found an item looking like this that had no mention of that name on ebay being sold by deluxcctv, when the box arrives it has CM Vision written on it. OK straight away I find your review and discover I had been duped. If they had any balls they would track down every customer who has one and give them a supposedly working updated model. Sorry to hear you got an unwanted surprise there, Allan. It’s too bad that this particular design looks so nice and rugged but has so many failures due to overheating of the internal components. I still haven’t seen any detailed info on what might have been changed with the improved version of this. Hi Steve. Thanks for the great write up. I bought two of these lights, one year apart. The oldest is now two years old and working well. The one year old unit has now seemingly failed. All LEDs now flash on and off every 1-2 seconds. I suppose it’s a power board failure but wanted to see if you had any thoughts? It’s a shame that a company can’t provide the most basic of quality for such a basic product. But I guess someone thought a 50 percent yield rate was acceptable. Appreciate your article and time. Thanks for visiting and letting me know about your failure with one. My first guess would be something on the power board too, but it could be about anything. 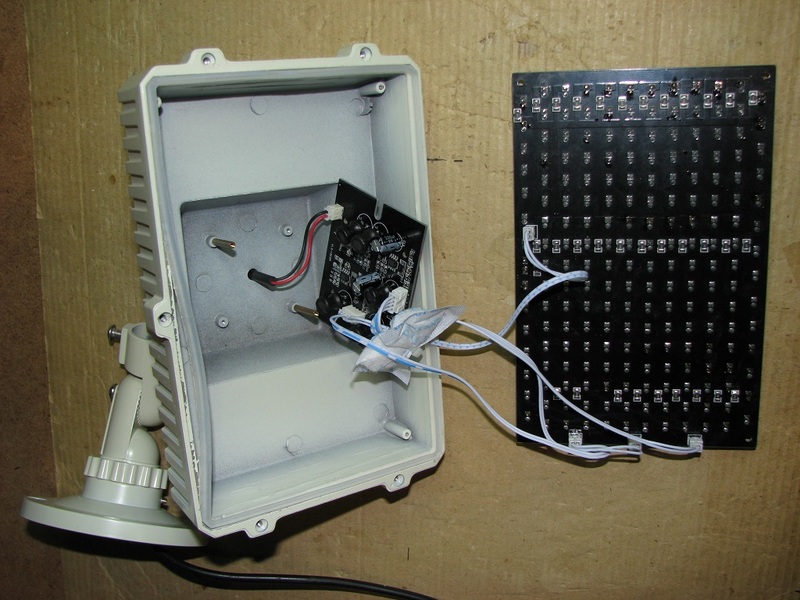 Maybe the power circuit that allow the photocell to switch everything on and off, but that’s just a guess. Appreciate your comments. Thank you for your detailed analysis and clear writeup (with photos!). I was about to buy one of these, but now I’ll look elsewhere. 1. The design margins are zero. If a rating for a part is 20 volts, I find it in a circuit supplying 20 volts (sometimes a bit more). A reasonable design margin would be to use 16 volts or to use a part with a higher rating. 2. The parts are invariably NOT derated for temperature rise. I live in Arizona, and have to deal with this problem all the time. The motors I have in my machine shop are rated for 40 C (104 F) (not 40 C above ambient). I have had indoor nightlights burn out when the air conditioning has been off for a couple days (an autopsy showed overheated, charred resistors). If the parts are to be used outdoors, they must be rated for AT LEAST 50C (130F) ambient or they are not worth buying. Yet, I usually have to write to the manufacturer to get the temperature specs. I guess these things are designed/made for a much cooler climate. Thanks again for the careful work and insights! Thanks Brian, I appreciate your comments. This is certainly not the unit to get for a location with high temperature extremes like you have in Arizona!